Which 2019 Chevrolet Colorado Is Right for You? While the Silverado may have received a complete overhaul this year, the 2019 Chevrolet Colorado is still going strong in its 2012-based second generation. The older design may not be around for much longer, however. Mid-size trucks are surging in sales, and the Chevy Colorado is ripe for a redesign like its older sibling. Even if it isn't brand new for 2019, the Colorado still has plenty of up-to-date offerings across five different trim levels. Here's what buyers can expect at each price point. The base-trim Colorado is only available as a 2WD extended cab with 6ft 2in box. If you're looking for a bare-bones option, this is the trim level for you. The 2019 Chevrolet Colorado Base comes standard with a 2.5L direct injected 4-cylinder engine and a 6-speed manual transmission. 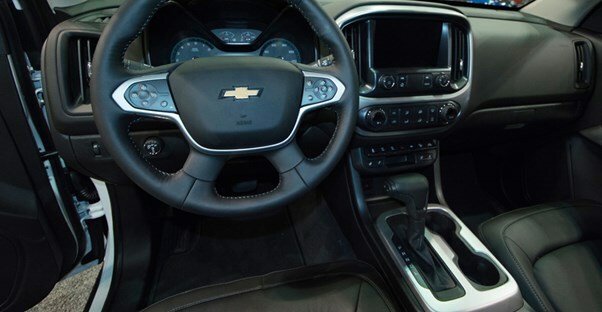 There's a rear-vision camera and a 7-inch diagonal color touchscreen with Chevy Infotainment System. The driver's seat is 4-way power adjustable, and the truck has StabiliTrak electronic stability control with traction control standard. Other than that, there's not much else to this base trim, hence the starting MSRP of $22,395. There is one thing the Colorado Base is good at, however: getting dirty. And without all those fancy features of more expensive trims, you won't feel bad about hauling anything or forgetting to wipe off your boots. The next trim up is the 2019 Chevrolet Colorado WT. We'll be talking about the configuration that most buyers will opt for: the crew cab with short box (just under 5ft 2in). What buyers lose in truck bed space they make up for a folding rear bench seat. A 2WD version will set buyers back $27,795 for those going with the standard 2.5L engine. Also standard on the WT is a 6-speed automatic transmission. Other than the addition of carpeted flooring, there still isn't much to the Colorado WT. That makes sense considering that the trim's name stands for "Work Truck." The main appeal at this trim level is that the Colorado WT's engine can be upgraded to a 3.6L V6. It doesn't have the fancy features so you can dirty it up as much as you can. Plus, it can give your work buddies a little bit more legroom when you're riding between jobs. A model with a crew cab and long box is also available at a higher cost. The 2019 Chevrolet Colorado LT is the first trim level that might appeal to more city-oriented drivers. A 2WD crew cab with short box and 2.5L engine with fetch $30,695. AWD is available at an additional price, as are 3.6L V6 or 2.8L diesel engines. For that price, however, the exterior features body-color rear bumper, mirror caps, and door handles. Additionally, the wheels are upgraded to a 17-inch aluminum set. Remote keyless entry is also standard at this trim level. Once drivers are in the cabin, they will appreciate the bigger 8-inch infotainment color touchscreen and HD rear-view camera. The 6-way power-adjustable driver seat will have you riding in comfort, as will the leather-wrapped steering wheel. If buyers want to shell out even more, they can opt for a crew cab with long (6ft 2 in) box. The 2019 Chevrolet Colorado Z71 is the next trim level up. At $33,695, buyers can drive home a 2WD crew cab with short box and 2.5L engine. AWD and more powerful 3.6L V6 or 2.8L diesel engines (as well as a longer truck bed) are available at additional cost. The Colorado Z71 is actually the top-of-the-line trim model since the Colorado ZR2 focuses more on off-roading capabilities. At this price point, buyers will find the Z71-specific off-road suspension and unique 17-inch painted wheels. Also standard are all-terrain tires and an EZ Lift & Lower Tailgate. For comfort, the Colorado Z71 has automatic climate control, a heated steering wheel, and wireless charging. As mentioned before, the 2019 Chevrolet Colorado ZR2 is the most expensive trim. However, it doesn't add much in terms of luxury comfort features on top of the Colorado Z71 trim. The only exception is the fully leather-appointed front seats. Otherwise, the focus of the ZR2 is on off-road performance. Given this focus, the Colorado ZR2 is only available in 4WD and the standard engine option is the 3.6L V6. The 2.8L Duramax Turbo-Diesel engine is also an available option. The only two cabin configurations are the extended cab with long box or the crew cab with short box. Standard features include an off-road appearance packed and suspensive, as well as increased clearance and track width. There is also a trailer hitch and integrated trailer brake controller. More cosmetic changes include a unique hood, fascia, and grille along with front and rear wheel flares. The whole thing rides atop all-terrain blackwall tires. A crew cab with 3.6L V6 engine will have buyers paying $43,995.